"The first stage is when you totally believe in witchcraft. The second is when you realize it’s a complete lot of rubbish. The third is when you realize that it’s a complete lot of rubbish; but that somehow it also seems to work." Tovah is my secret weapon. She has given me the tools and guidance to thrive and live my best life here in the city. She is generous in her exchanges and creates a safe space for healing and evolution. Her passion to share her gift with others is obvious in every interaction. She just is truly magical. There is no other way to say it. Her words resonate with me far beyond our session and I feel as though she sends me into the city with her support as my armor. Tovah gave me the courage to quit a toxic job that was no longer serving me and start my own company. 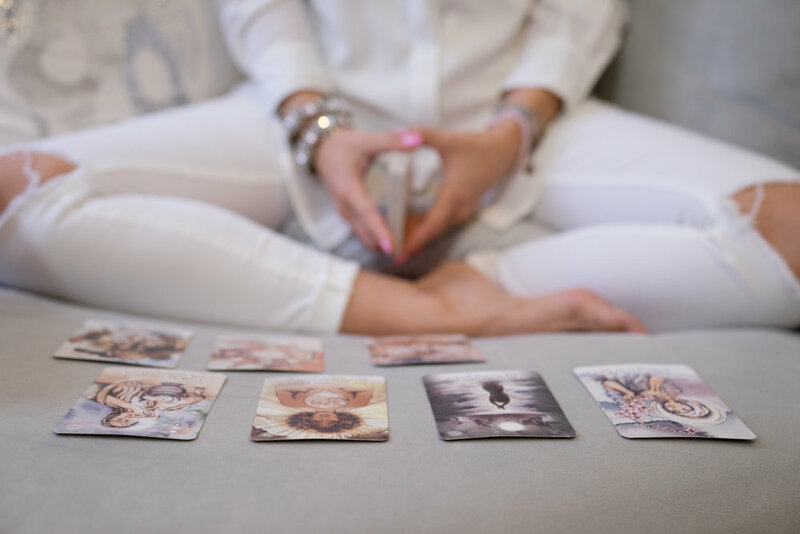 She has encouraged me to embrace my inner power and our readings are a true check point in in my journey to becoming my best most thriving self. I met Tovah through a mutual friend and had no prior knowledge of her work. Upon hearing her describe her craft my interest was immediately piqued. After several inquisitive questions and a business card exchange later, I decided to schedule an official appointment. I’ve never participated in a reading of any kind before so the days leading up to our session were filled with an anxious/nervous energy. To keep our meeting on-track I revisited the link describing her readings and completed her pre-session in-take form, Not only did it help guide our conversation but also helped to set expectations for our session. When I arrived to my session a sense of calm came over me and remained for the 90 minutes of its duration. Everything about my experience was fantastic. The atmosphere exuded serenity—it reminded me of getting on the yoga mat and getting into a deep flow state. Tovah’s instruction-led approach and open-dialogue style kept me informed every step of the way. Answers to questions at the beginning of our session materialized by the time we finished. For that 90 minutes she was the steward on my journey, yet we were partnered in parallel. I left my session completely blown away. I was also extremely happy with the high level of attention and professionalism by Tovah. I won’t get into detail but everything that we talked about ended up manifesting. When I look back on our conversation I am still in shock. Because of this, I will definitely return for another session (and perhaps multiple!). Tovah Avigail is a charming young woman who has a special gift for understanding astrology and being a Spiritual Concierge. Her bright and sunny disposition combined with clairvoyant abilities make her vibrational readings both healing and enlightening. At one time I was skeptical, but after seeing events unfold so close to how it was predicted, I live my life with more confidence and gratitude. You’ll probably agree with some information, be surprised by other topics that come up, but I wouldn’t dismiss anything that you might hear during your session. Certain events and transformations are happening 10 months after my session. Have you had a session or reading with Tovah? Please share your experience, We’d love to hear about it! Your identity will remain private.